Narendra Modi remembered Guru Gobind Singh ji on the occasion of Guru Purab. He admired the righteous and compassionate Guru who is remembered as an embodiment of courage, bravery, service and sacrifice. On Guru Purab, I bow to Guru Gobind Singh ji, who is remembered by generations as an embodiment of courage, bravery, service & sacrifice. The whole world are celebrating the birth anniversary of Guru Gobind Singh, the tenth Guru of the Sikhs founded the Khalsa Panth and gave the teachings of harmony, brotherhood and righteousness. The birth anniversary of tenth Guru of Sikhs Guru Gobind Singh is being celebrated across the globe with religious fervor and gaiety. Guru Gobind Singh was born in 1666 in Patna of Bihar, where Patna Sahib Gurudwara is situated. Devotees in huge numbers visit the Gurudwara on the occasion. 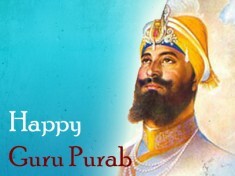 In 1699 on the day of Vaisakhi, Guru Gobind Singh ji founded the Khalsa Panth. He asked the members of the Khalsa to rise above the barriers of religion and caste and spread the message of brotherhood, communal harmony and humanity in the world. He told his followers to be ready to sacrifice for the cause of Dharma or righteousness. Guru Gobind Singh, gave the Sikhs their very distinctive symbols as marks of acceptance from God in the form they are, cleanliness, inspiration to do good and self defence. Devotees take out nagar kirtan processions and throng the Sikh Shrines to celebrate the occasion where Sabad Kirtans are organised. People from all walks of life celebrate the occasion and pledge to follow the path shown by the Guru.